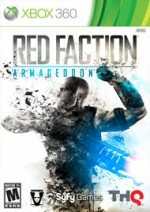 Protagonist Darius Mason tries to make Red Faction: Armageddon an exhilarating adventure. He wields a gun that fires scientifically implausible singularities, pilots a spider mech that “accidentally” tramples an entire underground city, curb stomps anyone that dares stand in his proximity, and knows just when to spit out an angst-filled taunt at an alien that clearly doesn’t understand English. For an encore, he uses a unicorn’s flatulence as a weapon of mass destruction. All of these awesome experiences can be yours if you don’t mind choking down hours upon hours of repetitive gunplay. I spent most of my time annihilating five or six different alien types within caverns that all look strikingly alike. I started getting far too excited over the most insignificant environmental differences, like one cavern having a crystalline stalactite formation or another replacing the typical rock path I’d traversed with destructible steel grating. The environment, as drab as it is, provides creative ways to attack foes – such as the magnet gun’s ability to hurl large chunks of metal across vast chasms – but I had to go out of my way to make the firefights entertaining. Most of the aliens, who look like giant insects from a Roger Corman science fiction movie, can be downed with little effort. This includes wildly flailing a hammer. The genocidal repetition is periodically broken up with a great vehicular sequence. Darius jumps into an Iron Man-like suit that packs plenty of firepower and can lower its shoulder to dash through heavily fortified structures. A few levels take place exclusively from a mech’s cockpit, where Darius rains swarm missiles down upon armies and their fortresses. The most surprising vehicle is a spacecraft heavily inspired by Descent (another of the company’s beloved franchises). The time I spent in the vehicles was my favorite part of this game. Challenge is practically non-existent in these moments, but each craft controls beautifully and the vast amounts of destruction they unleash created dazzling spectacles. Most of the destruction is crammed into suffocating caverns, so you won’t see as many giant towers toppling over as you did in Red Faction: Guerrilla. That said, weapons like the singularity cannon and magnet gun still allow players to artistically pick apart buildings and set up carnage-filled chain reactions. The arsenal packs more of a punch than Guerrilla’s, and the destruction it delivers is more satisfying, but most of the game’s structural damage is not tied to objectives. Guerrilla’s amazing demolition puzzles and faction-crippling structural assaults against the EDF are nowhere to be found in this game. Guerrilla favored open-world exploration and side quests. Armageddon is a linear shooter bogged down by mundane gunplay. Although it is a sequel of sorts, it’s a much different game, sharing more in common with a Call of Duty campaign than any other Red Faction game. Should Darius somehow lose his way on a narrow, straight path, or, heaven forbid, spend a few seconds gawking at the gorgeous texture work and detailed space-age technologies, large, glowing arrows appear in front of him, leading to the next uninspired alien bug fight. Even the game’s newest addition, the ability to repair objects, is used mostly to fix stairs and bridges along this linear path. It’s cool tech, but little fun comes from it. If you’re hoping this bumpy ride might be worth enduring for the story, which has historically been one of the series’ weaker points, I have bad news. This tale is an incomprehensible mess. The singular highlight occurs early on, when humanity discovers it is not alone on Mars. Once the aliens scurry from the depths of the red planet, the plot unravels into a testosterone filled “kill ‘em all” set-up. I couldn’t tell you what happened, although it does include an alien queen and a character that looks like an out-of-place Star Wars Sith Lord. In addition to the campaign, Armageddon offers an enjoyable score-based challenge in Ruin mode. Here, players are tasked with blowing up as much stuff as they can in a set amount of time on five tiny maps. Another mode, called Infestation, plays out just like Gears of War 2’s Horde mode. Infestation lasts for 30 waves, and progressively gets more challenging after each one is completed. Volition makes these challenges true tests of skill, but there isn’t much reason to sink more than a few hours into these modes. Armageddon is an unimaginative shooter, showing more creativity in Darius’ tribal tattoos than in any of its combat scenarios. If you’re looking for a memorable Red Faction experience, you’re better off playing Guerrilla again.